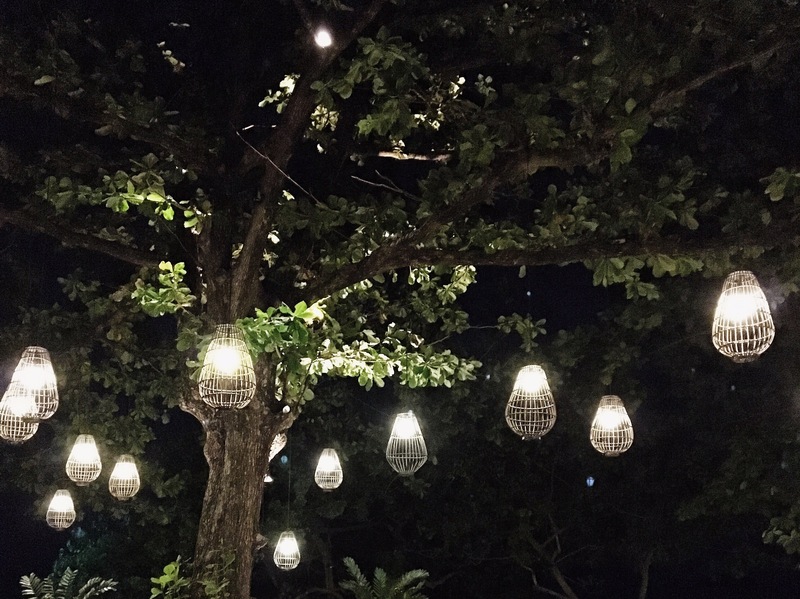 We met for two days in Hong Kong after a work trip and then flew to Bankok and on to Krabi. After a shuttle, longtail boat and motorcycle (with a trailer side car!) we arrived at our first accommodation, Railei Beach Club. 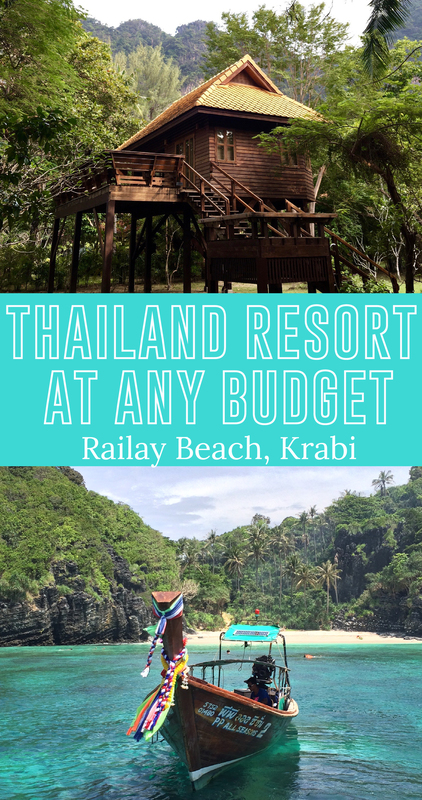 This was our budget friendly option, and our private treehouse was the perfect initiation into this friendly, relaxed island. Railei Beach Club is steps from loads of local Thai restaurants, but the property staff will also stock your mini (outdoor!) kitchen with groceries for very reasonable prices. 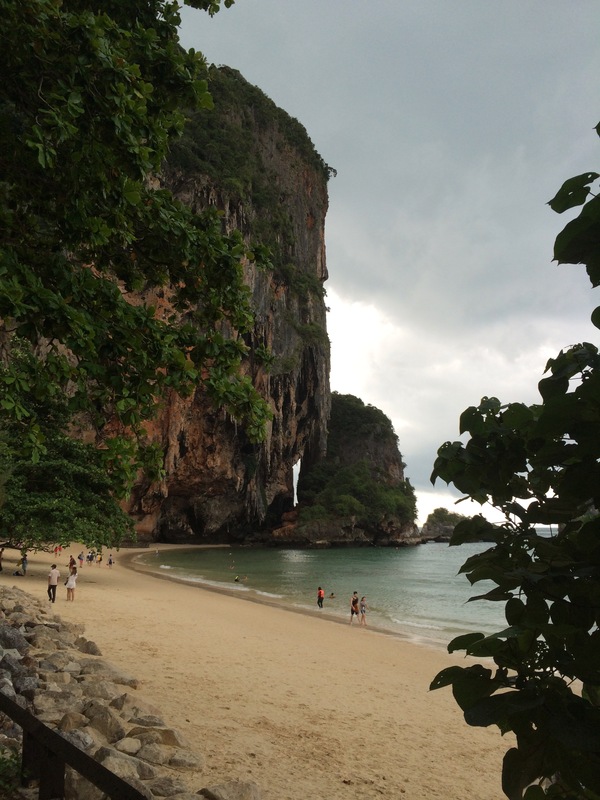 Grab a beer from the front office’s refrigerator and stroll down to the shallow cove of Railay Beach, or prop your feet up on the Mon Sam Lieung and ignore your beach-read for monkey watching. We stayed in Baan Sabaai Sea View, and since it was the “Green Season” (May-October) it was around $100 a night, not hostel rates, but these remote, tree top rooms are an exceptional value. 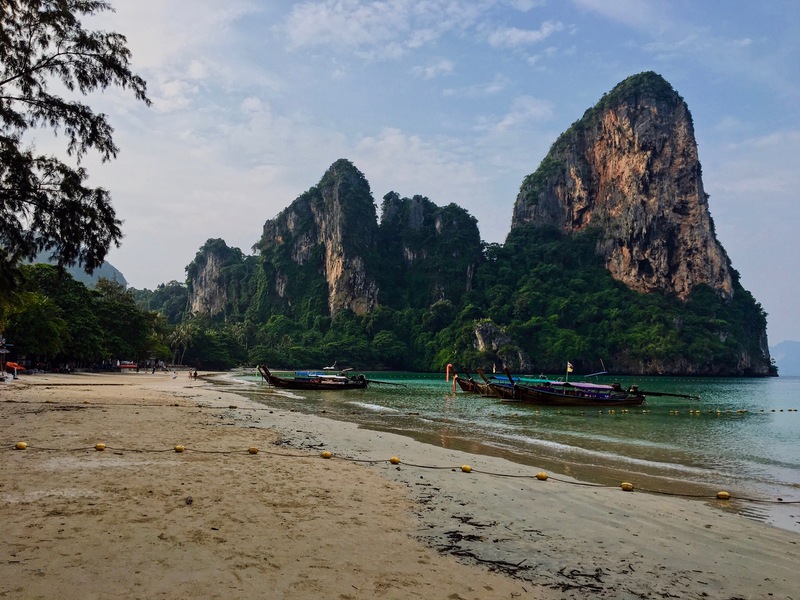 After we had our fill of lounging, we booked a trip on Krabi Sunset Cruises, a swimming and snorkeling expedition on a 100-year-old Siamese vessel to five islands. The cruise itself was very casual, between dips in the ocean we lounged on traditional Thai mats and tried to look comfortable. Maybe it was because I was pregnant and couldn’t enjoy the complimentary beer and cocktails, but slouching on the deck of the ship while the artfully scruffy, carefree travelers lounged in each other’s laps took me straight back to Junior high watching the cool kids from the sidelines. That said, Michael, our host, was nothing but gracious, coaching his passengers (including two kids, 8 and 10!) up the side of a rock face for cliff jumping, guiding us to some great snorkel spots and serving a fresh, homemade Thai meal, family style, at sunset. The excursion ended with a night snorkel to see the bioluminescent plankton. Full disclosure, as a lifetime shark fear enthusiast, I was not jumping feet first into pitch black ocean, until the two children hopped in without hesitation. I’m not a big risk taker, but I like to think I’m as brave as an 8-year-old, so in I went with the rest of the group. Movement stimulates the plankton, so when you shake your hand or kick they glow like tiny silvery bubbles. It was not the otherworldly neon glow you see in long-exposure photos, but magical nonetheless. 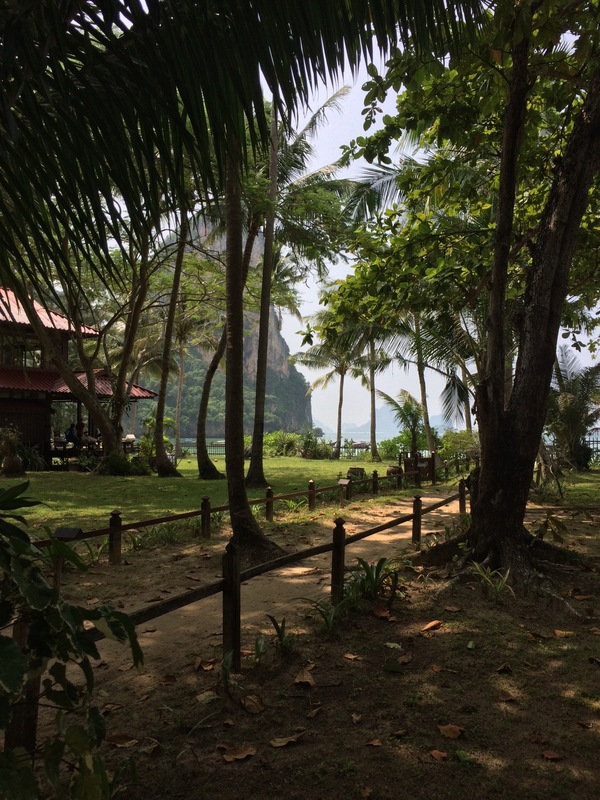 On nights four and five we moved to Rayavadee Resort, the entrance was steps down the beach from Railei Beach Club. We were greeted with cool towels and coconut spritzers and led through a lengthy but lovely check in process. 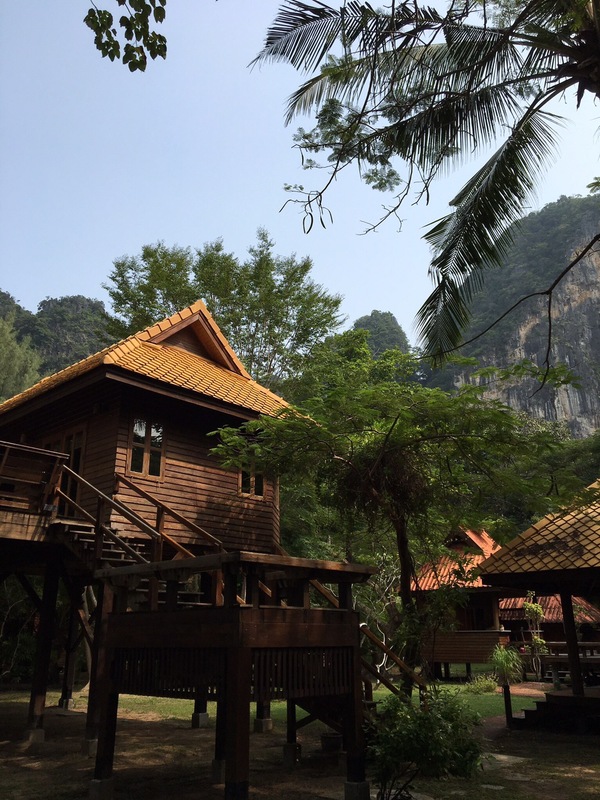 The rooms are private, two story pavilions sprinkled across the property from the limestone cliffs, through manicured jungle, and down to the more remote Phranang Beach. 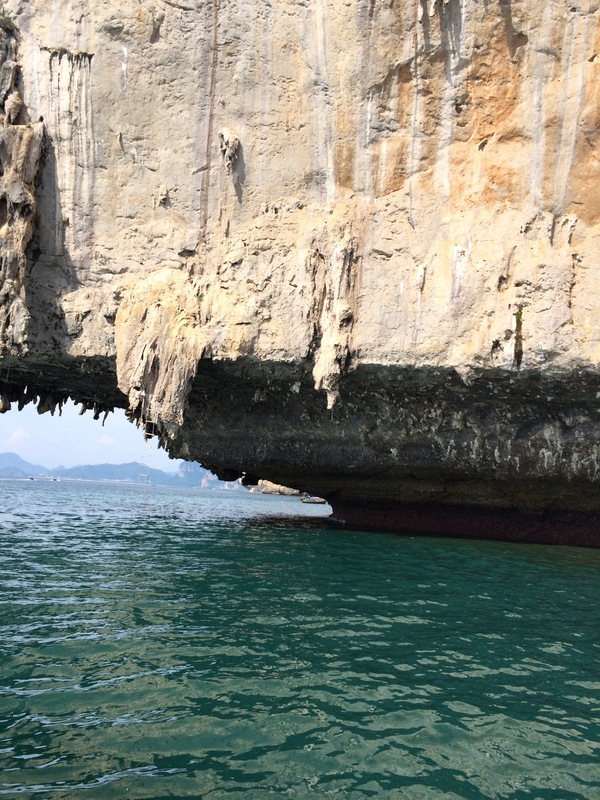 This is a view from Happy Island, just off Phranang beach, Happy Island can be reached on foot at low tide for a private view of the sunset around the cliff’s edge. 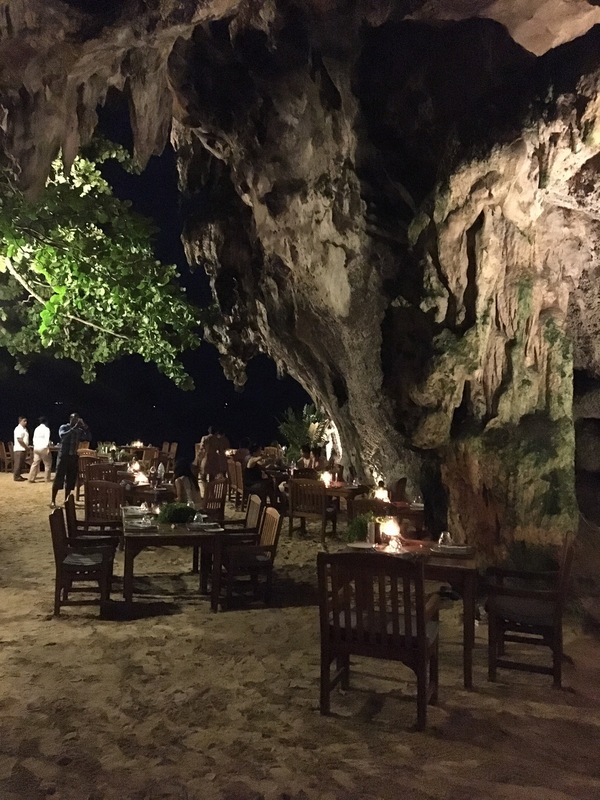 Our first night we wandered down to the Gotto, a cozy restaurant nestled into the limestone cliffs. Picture beach sand floor, natural cave overhead and fresh Mediterranean barbeque, we were totally transported. 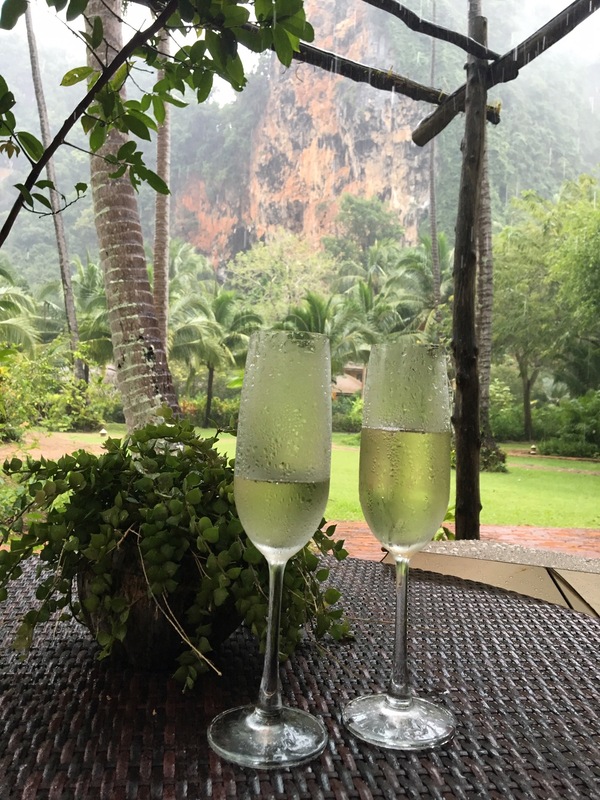 An afternoon sipping (minimal sips for me) complimentary Champagne and watching a storm come through from our covered porch. The heat and sudden moisture caused the verdant cliffs to release clouds of steam after! 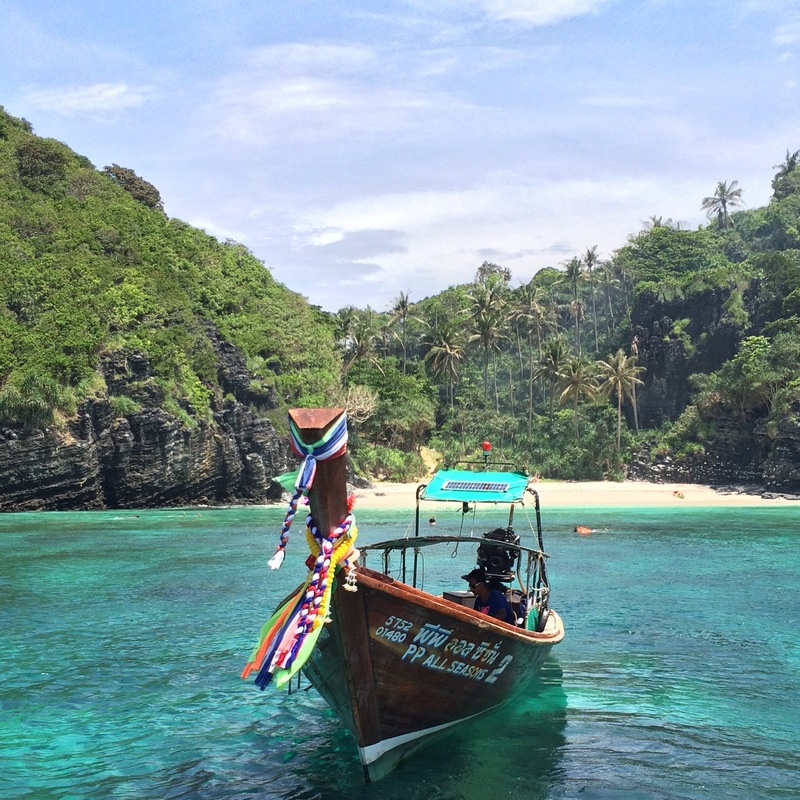 We booked a snorkel tour to Ko Phi Phi, laugh it up, it’s pronounced pee-pee, through Rayavadee on day five. 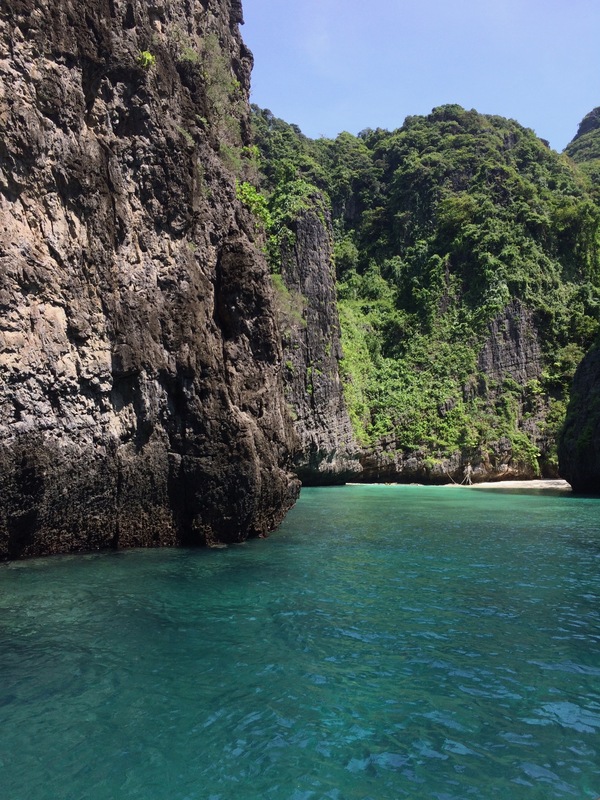 The trip was a very different than Mike’s casual and more local cruise, Rayavadee booked a sleek white speed boat to take a group of eight on a further trek to Ko Phi Phi and surrounding snorkel spots. 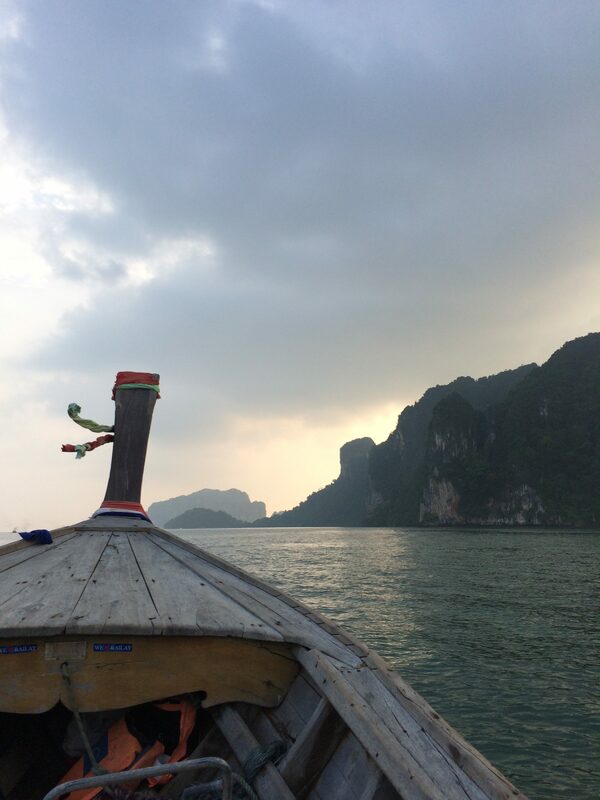 If Krabi Sunset Cruise was about the journey, this trip’s focus was the photo worthy destination. 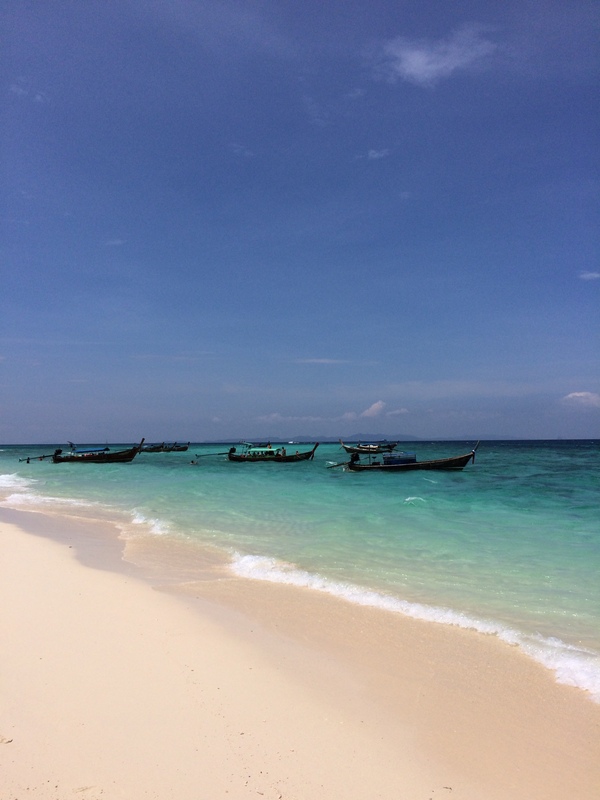 The beaches were PC screensaver circa 2001, white sands, virtually remote (we skipped the crowded but gorgeous Maya Bay) and the clearest turquoise water. Lunch was a picnic enjoyed in the shade of the jungle against a snow white beach backdrop. 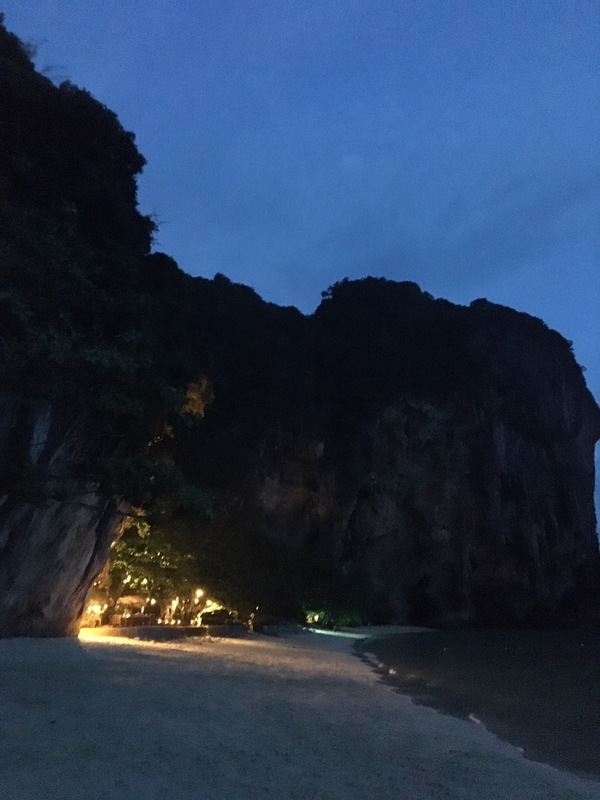 The whole trip was a show stopper and made staying on the quieter Railay Beach and day-tripping to Ko Phi Phi 100% worth it. Later this week I’ll share our Thailand hindsight insights and a little about our quick stop in Bangkok. That has to be my next trip — the photos are amazing!! 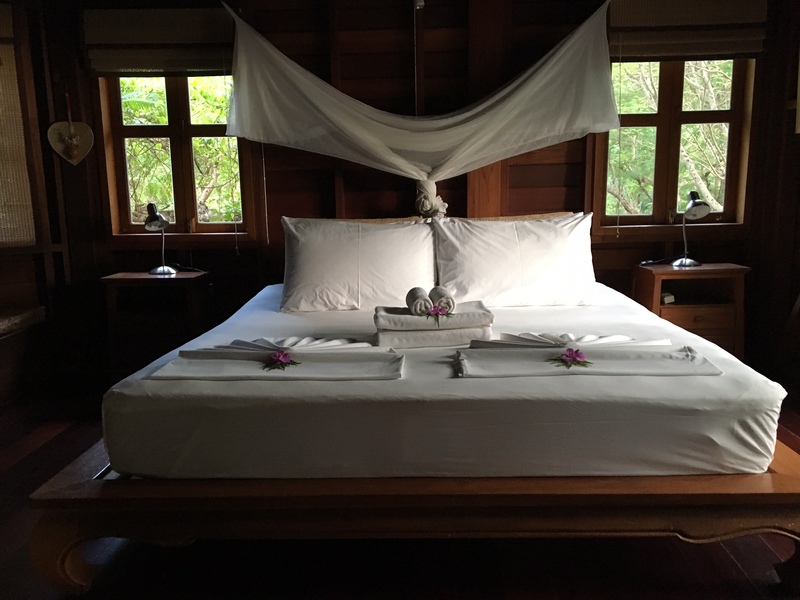 How did you like your villa at Railay Beach? We are thinking of staying in the same one. Thank you! We loved it!! 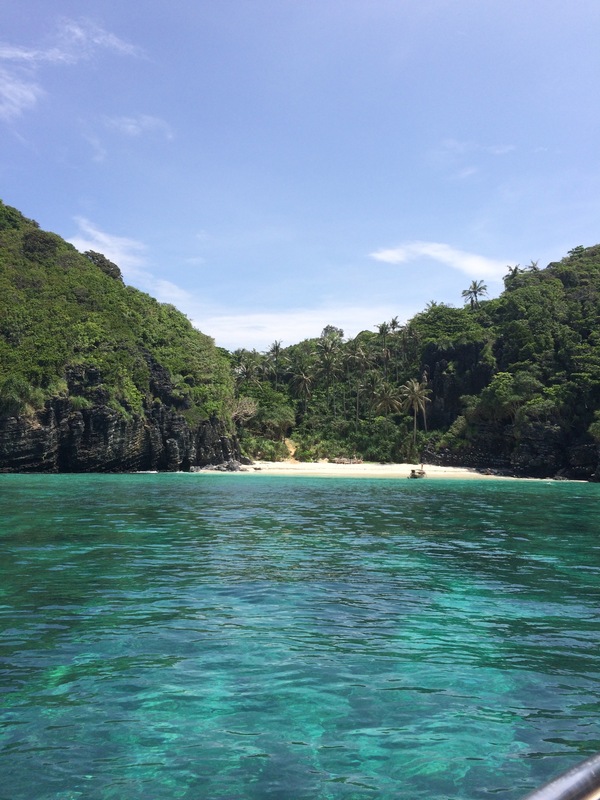 It’s a much more low-key scene than Phuket or some of the more famous beaches, but that is what I look for when planning a trip. That, and it was very walkable.